Today he's looking at laundry. How you clean your clothes has a big impact on the world, not to mention your energy bills. 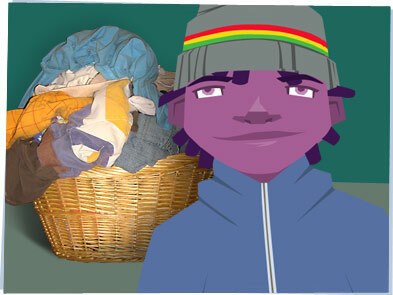 So Hector will now tell you how you can makelaundry-time green in just TEN WORDS! Should I wash clothes in cold water whenever possible? Is line-drying better than tumble-drying? Is it better if I use detergents that are earth-friendly because that water ends up in local rivers? Are roll-on stain removers better than ones in spray bottles because they use less stuff? Is it better to do one full load than two half loads? Should I only wash clothes when they're dirty? Should I keep the lint trap and vents clear to make sure the drier is working well? Was that last one Yes? Count how many baskets of laundry your family does in a week, then think of ways to save energy. Wash less often? Use cold water? Are you making changes at home? Share them with us. Co-Op America, "Going Green With Your Laundry"